Based on Mahatmas Letters Volume – III, page No. 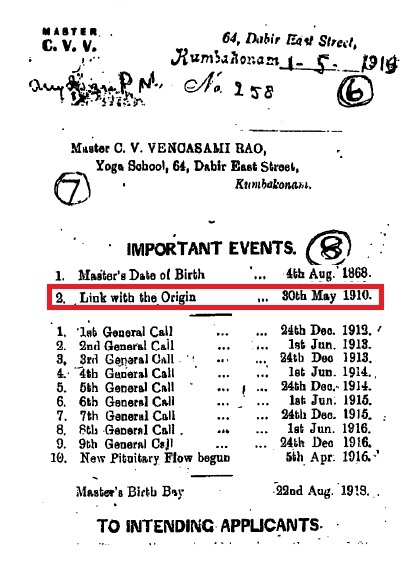 161, the “Link with the Origin” is recorded by Master C V V as 30th May 1910 under the heading Important Events. Master printed a Diary for the year 1918 to note down the Medium’s practice, timings and which course they have practiced etc. In that, he gave some rules and regulations for the members who intend to join. At the end of instructions, he mentioned the address as 64, Dabir East Street (New- No. 4/65 at present) See No. VII In the printed diary Master mentioned important events in the first page of the diary. In that he mentioned “Link with Origin” on 30th May. So the yoga friends are advised to follow the same as ” LINK DAY ” or ” LINK WITH THE ORIGIN ” by Sri.A.V.S.Acharyulu.